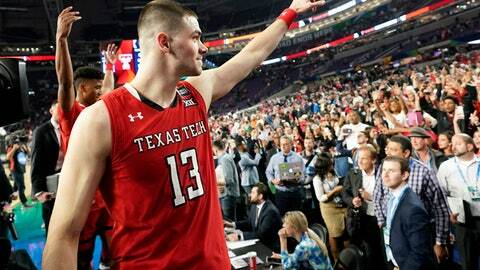 MINNEAPOLIS (AP) — Much like his vagabond coach, Texas Tech’s Matt Mooney has undergone a college basketball journey unlike almost any other, from mid-major to out-of-the-way outpost to the rough-and-tumble Big 12. Now, under the searing spotlight of the Final Four, Mooney has been simply money. The self-described “short, skinny” kid nobody but the Air Force Academy wanted, who starred for two years at South Dakota before transferring to the wind-swept West Texas plains, etched his name in Red Raiders lore Saturday night with a virtuoso performance in the national semifinals. Mooney poured in 22 points, including a spurt of three 3-pointers in a 2 1/2-minute second-half barrage, sending Texas Tech to a 61-51 victory over Michigan State and into a title tilt with Virginia. Yet the road was long and winding, filled with crisis and controversy, doubt and despair. Mooney grew up in the small Chicago suburb of Wauconda, Illinois, and fell in love with the game at an early age. By the time he reached high school, he’d make a 90-minute trek to Notre Dame College Prep to play under longtime NBA player Jim Les rather than attending the local high school. Mooney figured it would best prepare him for college, yet few coaches seemed to notice — they were probably too busy watching nearby Simeon Career Academy and the jewel of the 2013 class, Jabari Parker, who would star at Duke before becoming the No. 2 overall pick in the draft. The only Division I scholarship offer Mooney received came from Air Force, and he swallowed the idea of a five-year commitment to the military for the chance to play high-level hoops. Things went fairly well on the court, too. Mooney averaged 6.9 points as a freshman, sharpened his game and proved to a whole lot of doubters he could cut it in Division I basketball. Off the court was another matter. Mooney had trouble adjusting to the rigidity of military life, and he loathed the harsh way the upperclassmen set the tone. He ultimately decided to transfer, and later caused a stir when he accused the academy of promoting a culture of “bullying” that left him feeling depressed. The academy disputed his claim, and Mooney has since apologized for the accusation. But it didn’t change the fact that he needed a fresh start, which Mooney found at lower-rung South Dakota. For two seasons, he averaged 20 points a game and led the Coyotes to a pile of wins. But they never reached the NCAA Tournament, always a step behind mid-major star Mike Daum and rival South Dakota State. So when Mooney realized he would graduate last May, he once again began looking at transfer options. He settled on an unlikely fit in Texas Tech, the kid who’d chafed at authority making the decision to play for a program whose pillars are structure and defense. Then again, maybe he chose Chris Beard as much as he chose Texas Tech. The Red Raiders coach has been on an odyssey of his own, cutting his teeth at junior colleges in Kansas and Florida, low-level schools McMurray and Angelo State, even the semi-pro ABA, before and he got his big break at Arkansas-Little Rock and parlayed one year of success into the Texas Tech gig. Turns out Mooney and Beard were a match made from basketball morass. Now, the kid nobody wanted and the coach nobody gave anything to have embraced the chance of a lifetime. After winning a share of the regular-season Big 12 title, they have marched their way through the NCAA Tournament, dispatching Michigan State in the semifinals with cold, cruel efficiency. It was Mooney that had to lead the way. With star forward Jarrett Culver struggling and Owens hobbling toward the locker room, Mooney began to rain down 3-pointers. On defense, he locked up Spartans point guard Cassius Winston, forcing the Big Ten player of the year into his worst game of the season. Yes, the Red Raiders triumphed because he was in the zone. Will he still be Monday night? Virginia boasts one of the nation’s top defenses, and shutdown guards Ty Jerome and Kyle Guy will likely share the challenge of stopping him. And any chance Mooney had of getting overlooked is long gone. Regardless of what happens, though, he promises to enjoy one last night under the lights. The final stop on a memorable voyage through college basketball.